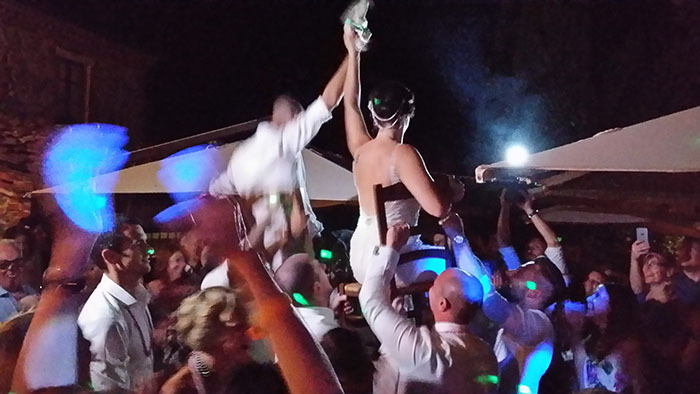 A beautiful wedding party at Borgo Casabianca. We think that when Caroline and Gavin (AKA the bride and groom!!!) from England decided to marry here they were not looking for a busy hip-hop location but for good Italian food and Tuscan landscape!! Borgo Casabianca (Loc. Casa Bianca, 53041 Asciano – SI) is an incredible resort nestled in the beautiful hills of Tuscany, the atmosphere at the location is so calm and peaceful, the pool with great views of the Tuscan hills is simply spectacular and there’s also a cookery school where you can learn the basics of the Tuscany cuisine, cook a complete menu (cooked by your hands!!! ), to be tasted after. Okay, let’s go back to that: the big day!!! Guty & Simone set up a sound system+wireless microphone nearby the dinner table for the entrance song/ background music and for the speeches during dinner; then they set up their main sound system, instruments, dj gear, lights system in the courtyard for the after dinner dancing party; the after dinner Live performance +Dj set by Guty & Simone begin suddenly after some traditional Jewish dances as the chair dance where a few strong guests hoist the bride and groom high above the crowd on chairs to the sounds of the Hora….the dances goes on till late in the night and everybody dance to the live and dj music of Guty & Simone the Italian wedding musicians from Tuscany! !